Last month, the first Asian Media Awards took place at the Hilton Hotel in Manchester with the aim of showcasing "the very best talent working in the Asian and mainstream media". I was lucky enough to attend the event as Asian Fashion Blog was nominated in the category of "Best Blog". 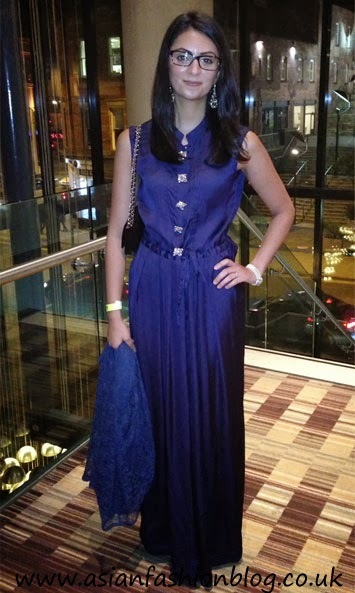 I didn't win, but here's what I wore and some photos of the other attendees on the night! Although the picture probably doesn't show it, this is a jumpsuit! 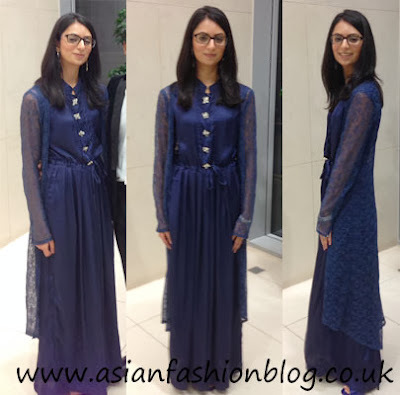 I was debating whether to wear an Asian outfit or an evening dress for this event and as I'd left it too late to order something online, I decided to see if the asian shops in Manchester had anything fusion style within the budget of £100 I had available. I visited Wilmslow Road, but gave up after the first few shops as I was only seeing quite heavy outfits or big prices and I wanted something a little more understated. 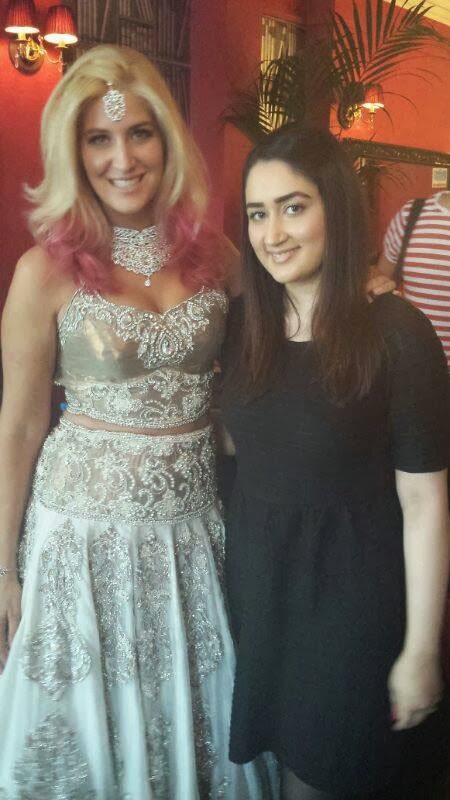 By chance, I popped into a store called Vaneeza's Boutique, which I often drive past, but hadn't been into before. After browsing their rails and finding outfits I liked but which wouldn't be right for this event, the staff in store mentioned they had just got some jumpsuits in stock. I was a little unsure when I first saw it on the hanger, but I tried it on and it completely matched up with what I had in mind. I paid £95 for it and was very pleased with my purchase! 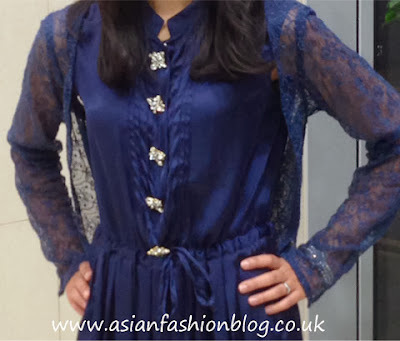 I like the little details like the pleats on the front and how it fits on my shoulders. I must admit I wasn't overly keen on the blingy buttons to begin with, but overall I think they add just the right amount of sparkle without going over the top. I probably could have tied the waist-tie a little more elegantly, but in my defence, I did have to get changed in the toilets at work in order to attend this event on time! You can see all the winners and clips from the event on the Asian Media Awards Youtube channel here. 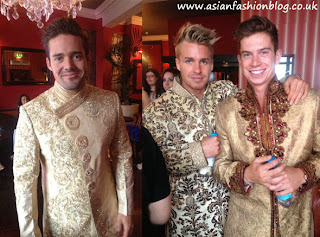 This week saw a lot of asian fashion on TV in the UK as reality show "Made in Chelsea" featured a Bollywood-themed party, complete with stereotypical "screw in the lightbulb" dance moves! 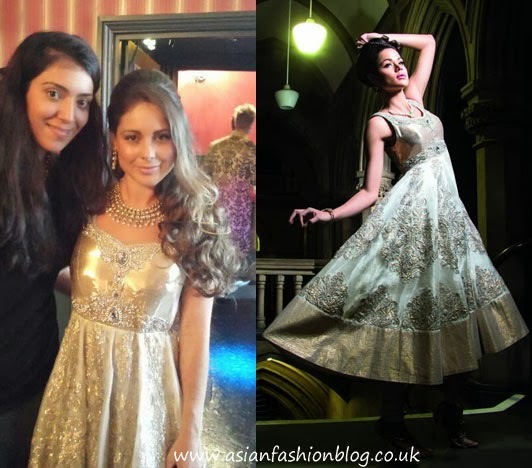 Not one of my favourite designs by Ekta Solanki, I couldn't find an exact photo of this same outfit on a model/bride, but I found something very similar. For the most part I think she looked good, although I nearly changed my mind after seeing the final scenes of her stood at the bar with it draped very badly on the floor! I really liked this outfit on her, the colour suited her and she looked comfortable in it. First of all the nose ring/nath was probably a bit too much for an occassion like this, and it was used as a talking point/part of the storyline for Phoebe and Lucy to insult each other! As for the dress...too much cleavage! I don't think it really suits her and even on the model it's one of those dresses that needs every single element to be co-ordinated for it to look good. I think it might have looked better with her hair more open. 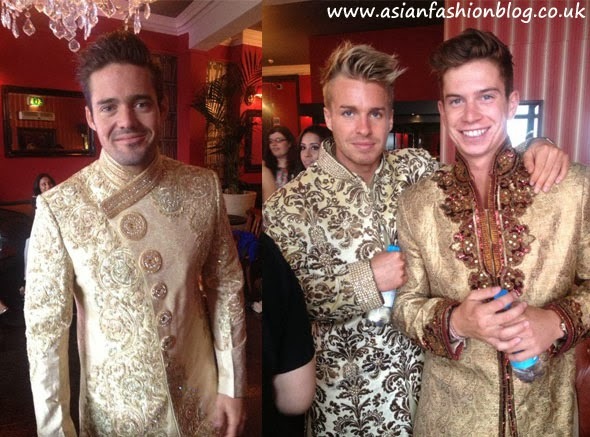 I liked how most of the guys looked in their outfits (some of which you may recognise as they're by Ziggi Studio), although my least favourite would be the brown sherwani worn by Jamie, I just don't think it suited him! I really like this outfit and think you can't really go wrong with it, it's just a shame you didn't get to see the full vibrancy of the lehenga in the dark setting of the party. 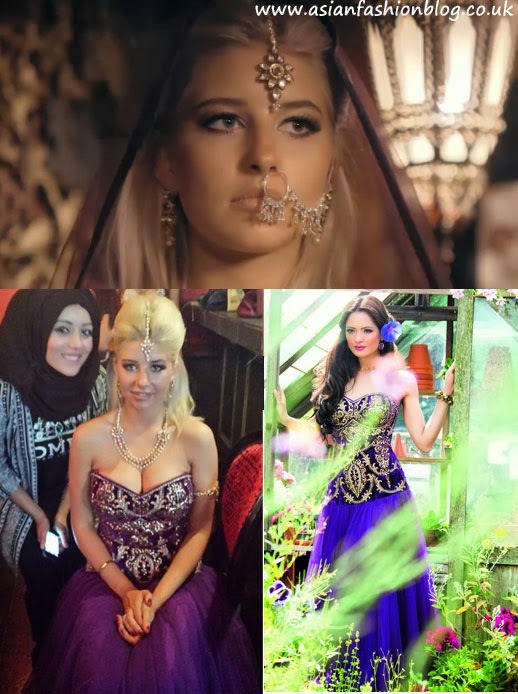 Victoria's outfit was from Bibi London and I think she worked the "bollywood" look better than any of the other cast members. This was definitely a favourite of mine! Did you watch the show? Which were your favourites and least favourite? A huge thanks for Lubna Rafiq Agency for the backstage photos.